Assuming most of the Wisconsin top runners go to Nike, what surprises could develop? Does Bosley take it easy and just qualify instead of going for the win in order to stay fresh for FootLocker? 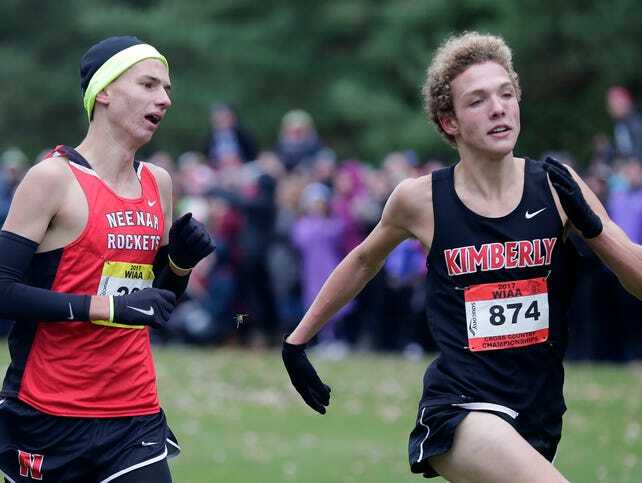 Does Meinke have a big race left in him this season? How many from Wisconsin advance? Who are the other top kids from other states? Peters SD is the favorite after winning Griak. Bosley is probably next. Carmody IA was 2nd at Griak and 2nd at IA state meet in 4A behind Sindt but it sounds like Sindt won’t run. Hussein MN is one of the top guys but will qualify as part of a team. Manley MN will be in the top 10 but team may also qualify. Sieperda IA has run low 15s several times this year and he likes to lead. The next few WI guys have an outside shot but they didn’t make the trip last year. I predict the 5 qualifiers to come from SD, MN, WI, and IA. MN may have 2 guys make it on teams which could open up 2 spots each for WI and IA. The Nike Heartland race is 11-12. Neenah junior Matt Meinke entered as one of the favorites to win the D1 competition, despite battling a cold, double ear infection and sinus infection. Meinke finished fourth with a time of 15:46.49 but battled Bosley of Homestead before waning at the end. “I was just battling the first mile,” Meinke said. “It went real slow for me and I made my way up at two miles. I was second and me and Drew battled the last mile and then I got passed up by two people. No offense to this kid at all as he completely has my respect. But it’s time to hang it up for the season instead of trying to cultivate some come from behind path to redemption. As evidenced by many past elites beyond Newcomb, it just doesnt work that way when a contingent of factors like those listed above are present. Totally not saying he isnt capable but those winter months can get very long when youre suffering mentally from what should’ve been. Time to unwind and regroup. I would much rather see him shut it down, aim to run a 4:17/9:25 indoors by early April in track and then bring it outdoors for a 4:11-4:12/8:55. At State, I thought Meinke was just worn down from the season. After learning that he had been very sick, I am totally impressed with his effort at State! Incredible! Who knows what he could have done had he been healthy! He is definitely the Rocket man but I can’t help but notice that he needs some help with his upper body form. Maybe it is because he has played soccer so long but he really leads with his shoulders quite a bit and I think that if he smoothed that out he would save tons of energy left over that might make him invincible. Obviously he was much better than 15:46 if healthy. I agree I think he needs a couple weeks down and have some kid fun and just hit the weight room and pool for awhile before getting back to business. Good luck to him and looking forward to watching him this spring. You might be hedging your bets. Do you want to clarify which Ping will be 6th? Also I think Wolfgram will give everyone a run for the money because she soloed state basically, she probably should be ranked ahead of Covert. Wolfgram #1 and if Grace didn’t beat herself up too badly both Ping girls in the top 7. I’m also picking Hussein over Bosley. Picking Grace Ping 6th and final qualifier. Sis will probably be top 10 also. I will also clarify that only 2 boys teams will qualify but 3 will make it through for girls. It looks to be tight for the qualifying spots after Wayzata. 5th runners for boys need to run 16:15 to finish 100th because if they drop to 16:30, they will be adding 40 points compared to the competition. The fields get deeper every year but I don’t see the winning times from last year being matched. Curious about your high placement of Nock. I’m not super familiar with Iowa, so you may be right, but her times and head-to-head matchups don’t really scream “NXN Qualifier” to me. She won the Heartland meet in Ames and I watched her win several other times looking easy. I am not extremely confident but the odds are against an all MN group. I am hoping that others post predictions so I can compare. I just don’t see more than a few obvious qualifiers in either gender. Pleasant Valley struggled early in the season but won their last 5 races including the state meet. Their number 1 runner ran 4:19/9:21 in track as a Jr. He had a slow start to the season and has been steadily improving finishing 4th at state. They put 5 in the top 22 at state with number 5 running 16:15 and 6th runner running 16:35. Dowling beat Middleton and Edina at Griak but Pleasant Valley beat Dowling by 45 points at state. If they duplicate their state performance, they will be tough to edge out for 2nd. Apparently there is a tremendous amount of kids registered for Heartland NXR. This is part of an email that was sent out this morning. CHAMPIONSHIP RACES-We have set the fields for the boys and girls championship races. If you registered for the championship race you were NOT guaranteeed entry. We will have record entries in the meet again, with over 3000 in the high school races alone, so the task of setting the championship fields was a difficult one. We strongly encourage you to check your final race assignments if you entered the championship race. All you need to do is log into your Athletic.net account and and review your athlete race assignments. If your team or individual did not make it in the championship race, you will easily be able to see that from your account. More importantly, you will also be able to see what race we re-assigned you to. Box assignments will also be posted at http://nxrhl.runnerspace.com but probably not until sometime on Thursday. Bittersweet. Footlocker MW will always get a great turnout but Nike HL has really grown over the past 12-13 years to the point where they cant accept everyone into the races they want. The course in Yankton is a pancake too!